Somedays I feel like all I do is clean. I easily get burnt out from cleaning messes that never seem to stay clean. We all could use a little boost of motivation to keep our homes in order and from becoming confused with a land fill. 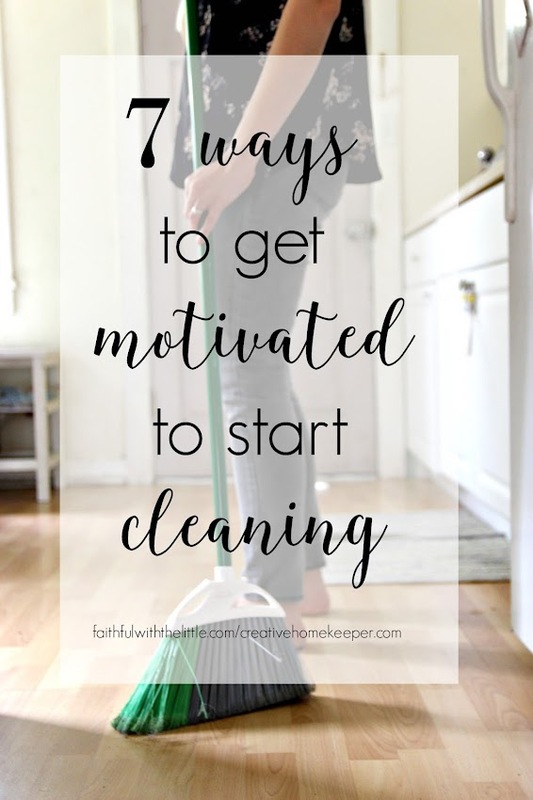 I don't have a perfectly clean home by any means, but I have found some ways that help me stay motivated when just don't feel like picking up another mushy cheerio or cleaning another spilled drink. If you need some extra motivation as well, I would love for you to check out my post over at ---->The Creative Home Keeper. I am excited to be joining the contributor team to bring you encouraging and informative posts to help inspire you as the keeper of your home! I always need motivation for cleaning!! Number 2-Invite friends Over- is usually the reason I clean! Lately, I try to do a little bit more every day. Go to bed with the dishes done so they don't pile up even more the next day. Put away a few more clothes than the day before. Spend a little less time relaxing. It's all about the baby steps for me. :) Thanks for sharing at the Family Joy Linky Party! I have been putting your tip about doing the dishes before bed to action. It seems so hard but is worth it. Yes, a little bit at a time makes such a difference!